Shalgam is widely available these days. I had not tried any shalgam recipes until last year, but this year, it's different. I have experimented a lot with this vegetable, which comes with multiple health benefits that I have already discussed in my earlier post. This post gets inspiration from my dear friend Anna's shalgam matar post. I had got really late for lunch today. Just a quick glance at her recipe gave me the inspiration to go ahead with the recipe with my own modifications. The result did not disappoint; rather, I have made the tangiest shalgam matar today. Sabut dhaniya- 1/2 tsp (smash in your mortar and pestle...or you may use your rolling pin (belan) - In the recipe I will mention it as coarse dhaniya. Pressure cook shalgam in little water with salt for 2 whistles. Chop onions, tomatoes and keep aside. Cut shalgam into small pieces. Drop oil. Once it reaches the smoking point, throw in hing and dry red chilly. Now add ginger-garlic paste and stir fry until the raw smell is gone. If you are using green chilly, you may add it now or later. Depends on you. I did not use. Next add chopped/sliced onion and fry until they turn translucent. Now add chopped tomatoes and fry until the masala leaves oil. Drop in the gur. You may cut it into very small pieces or grate it. I simply dropped one small piece into the masala. Stir very well. You may sprinkle little water if the masala sticks to the bottom of the vessel. Now add shalgam and matar. Cook on medium flame for 5 minutes. Now stir well and then cook and cover for another 8-10 minutes. Just keep checking that it doesn't burn. If it sticks, add little more water to prevent burning. Sprinkle coriander powder. Mix and enjoy chatpatta shalgam with rice or roti. 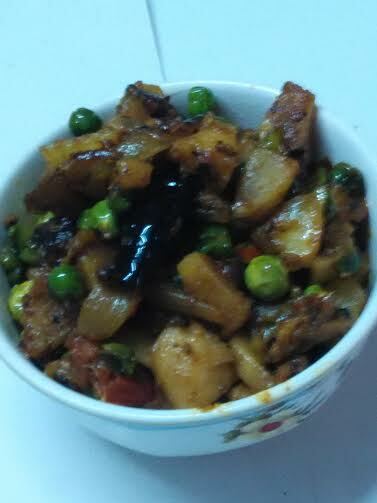 If you want, you may mash shalgam once done and enjoy khatta meeta shalgam matar bharta.